This year, over 100 people applied to study at the Hawza, and after a thorough screening and interview process, 65 applicants were accepted and have started their Hawza education. To mark this special occasion, the Hawza Ilmiyya held an opening ceremony in which respected scholars, teachers and students attended to mark the beginning of the academic year. Those scholars in attendance included Shaykh Dr. Shomali, Shaykh Zafar Abbas, Shaykh Fartousi, Sayyid Ali Reza Rizvi, Shaykh Jafar Najm, Sayyid Saeed Khalkhali, Shaykh Mirza Abbas and Shaykh Mohammad Ali Ismail. Speaking to the students of the Hawza, Senior scholar Mawlana Shaykh Zafar Abbas, gave a heartfelt talk highlighting his lifelong experiences in the service of the Hawza and congratulating those who have joined the Hawza. 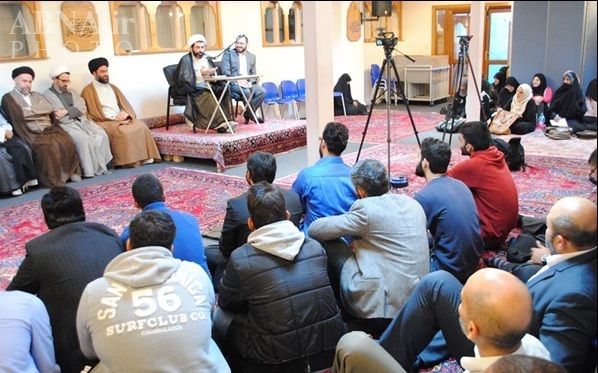 In addition, students benefited from Head of Majlis Ulama Shia Europe, Sayyid Ali Reza Rizvi, who gave an inspiring speech about the importance of sincerity and pure intentions for those who have chosen to embark in Hawza studies, giving examples from his own life as a student in the Hawza. Finally, the students had the privilege of benefiting from a talk by the Director of the Islamic Centre of England, Hujjat Al-Islam Wal-Muslimeen Shaykh Shomali; who gave a talk about the history of the Hawza Ilmiyya of England and also outlined important points regarding the etiquettes and responsibility that falls on the shoulders of those who have embarked on this journey. The head of Hawza Ilmiyya honoured the previous efforts done in establishing the entity and expressed that with the great legacy and use of scholars, we will endeavour to address the problematic issues faced by Muslims in the West. Shaykh Shomali also emphasized on the importance of keeping the environment, a spiritual haven for the staff and students and hoping that this will be an initiative to spread the light of Islam to Muslims and non-Muslims. We pray that the students of the Hawza have a beneficial experience at the Hawza and will grow both spiritually and academically to be able to serve the community in years to come. This entry was posted in Europe and tagged Hawza Ilmiyya, Hawzaa Ilmiya, Islamic Seminary, London, Sayyid Ali Reza Rizvi, Shaykh Fartousi, Shaykh Jafar Najm, Shaykh Mirza Abbas, Shaykh Zafar Abbas. Bookmark the permalink.